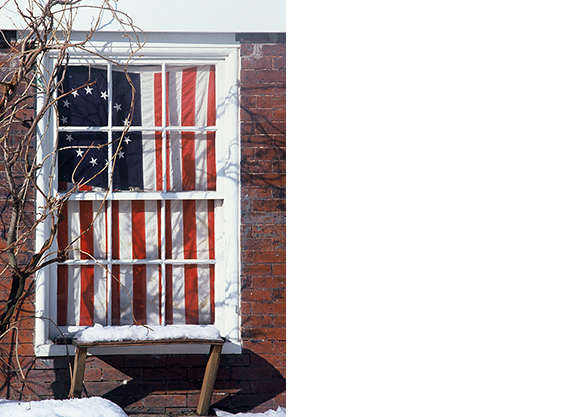 It’s the fourth and time for a red, white and blue celebration. Have a party. Dress up your table. The following are some quick and easy tried and true tips. When planning the food think color. For example there is nothing better than a white bowl filled with bright red strawberries and blueberries. For a barbecue use washcloths for napkins, white with blue or red stripes. Roll each one around the utensils and tie with a flag ribbon. Insert the rolled cloths into a bright red or blue paint bucket. This is one time when paper or plastic is totally acceptable. Another napkin idea is dishtowels. The over size is great for a barbecue and easy to launder. Choose the linen dishtowels in a red or blue check. For a table cover, I love to use quilts. 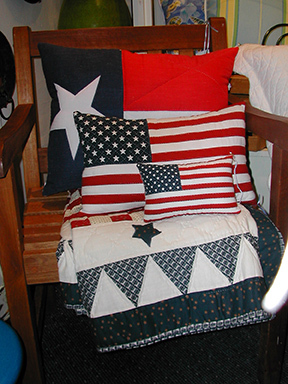 A red and white or blue and white quilt is perfect for this holiday. Red roses or geraniums with blue Bachelor Buttons in a white pitcher for a centerpiece. Tie red, white, and blue grosgrain ribbon around the handle. My friend Rose always serves a saladin a white enamel wash basin with a red rim that she found at a yard sale. Great when filled with red and blue berries with watermelon. Rubbermaid’s line of inexpensive plastic glasses are lightweight but as thick as Lucite and until you actually lift one you can’t tell it from the real thing. They come in two sizes in clear, or with a smoky gray or pink cast. This is a far cry from the paper or plastic glasses associated with picnicking and while you can’t toss them away after using, they won’t break if dropped, they are dishwasher safe, and they will last forever. Great for a pool party. All white plastic dishes are much nicer for a picnic than paper plates and are worth the investment as you can use them over and over again. They come in dinner and luncheon sizes. A plastic plate may be unacceptable for a dinner party but it adds substance to a picnic when paper plates are expected. And the Melamine plates are great in different colors and patterns. Large country baskets are perfect for holding just about everything. Line them with a checkered napkin. Another napkin idea is to use red and navy blue bandanas and tie with contrasting ribbons. Use a small child’s red wagon to hold all sorts of items from drinks to lobsters on a bed of ice. Or fill with ice and set cans of sodas and bottles of beer on top. For a family picnic, frame old baby pictures and intersperse around the food or make a grouping in the center of the table. Your guests will have fun identifying themselves. Mushroom and berry baskets from the supermarket make wonderful plant holders. You can spray paint each one or sponge paint with acrylic and a sponge brush and tie a ribbon around the rim. Fill with plants and line them up down the middle of the table. Or use to hold food. I love the clear Christmas tree fairy lights and buy several boxes during the holidays to save for summertime. I wrap the branches of a large birch tree that hangs over my outdoor table with tons of lights and keep them on all summer long. It creates a sparkling umbrella of lights outdoors and makes all meals seem more festive. Stuck for time? 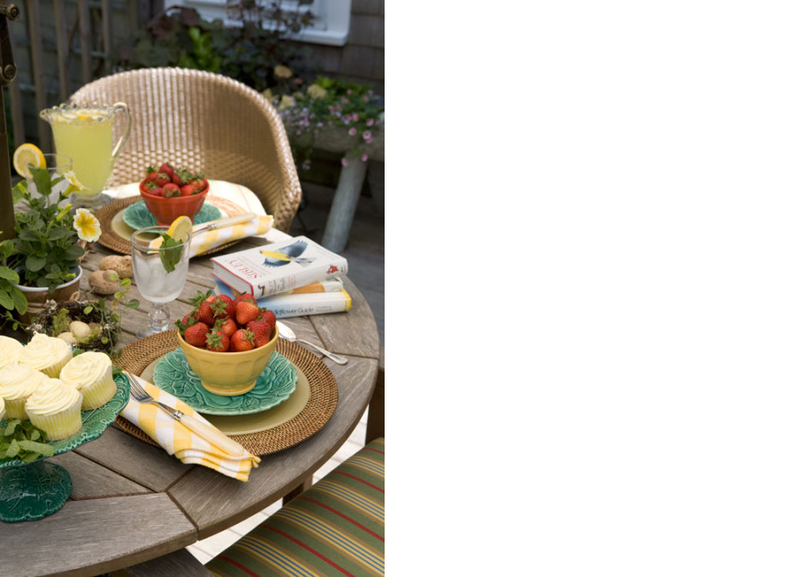 Bring out everything in red, white or blue and arrange these items as if for a photograph. This little tablescape can become casual centerpiece. For a quick, easy, temporary and fun holiday touch, take the little souvenir flags off of the poles or sticks on which they come and pin the flags to the front of throw pillows around the deck or patio. Create a party apron by stitching a strip of fabric or ribbon long enough to tie around your waist to the top of a red and white plaid dishtowel. For a truly instant display, remove labels from small juice bottles with hot water and fill them with water colored with red and blue food coloring. Line them up on the window sill and insert one small blossom in each one. Tie ribbons around the necks. These might also be placed at each place setting on the table. Use a metal watering can to hold a bouquet and tie ribbons to the handle,. For instant placecards, write each person’s name on a tiny paper toothpick flag (the kind sold in packages for cocktails) and insert into the food served as your first course.